2 Pasos obligatorios 1. Road Map 1. Hoja de Ruta 2. Análisis del País 3.Planificación Estratégica 4. S&E 3. Strategic Planning RECALL the 4 Key steps presented earlier today. 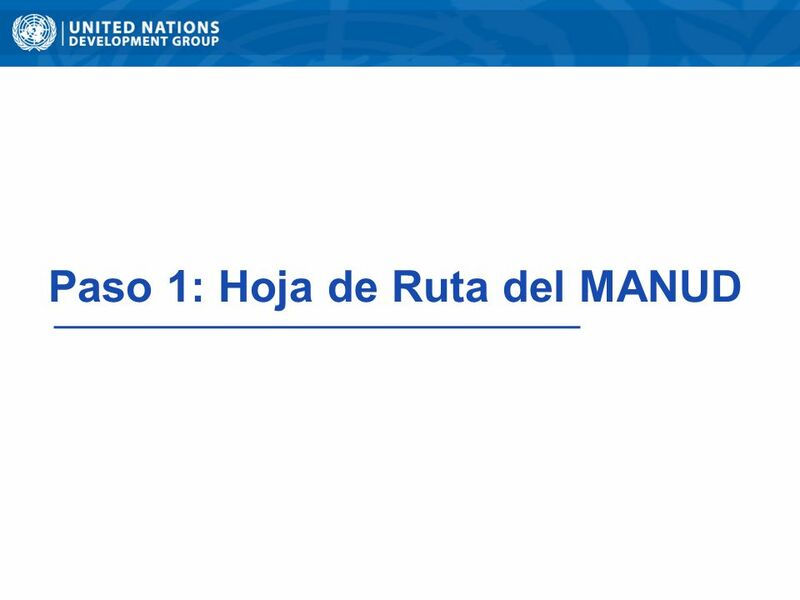 In this session we will focus on Step1: The MANUD Hoja de Ruta. We will discuss its purpose and why it is important. We will look at some examples of roadmaps done for the 2009 & 2010 MANUD rollouts. 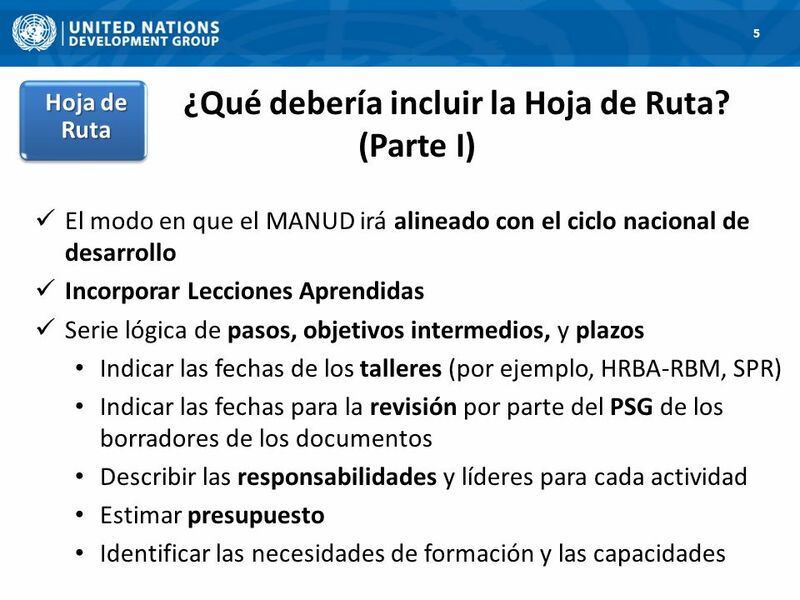 But the main aim of this session is for you to produce the first draft of the Hoja de Ruta for your country. 3 Hoja de Ruta 1. Hoja de Ruta Propósito: organizar el proceso del MANUD Describir el proceso de preparación Asegurar su completo alineamiento con el ciclo nacional de planificación Asegurar un proceso completamente consultivo para garantizar la propiedad nacional Identificar el apoyo necesario desde las oficinas regionales y la Sede Timeline: Potentially significant reduction in the current timeline of 24 months. ExCOM agencies are recommended to urgently address the issue of reducing the timeline of country programme document approval process, with their respective Executive Boards. This will ensure that the agency-specific programming cycle is harmonized with the MANUD cycle, and thereby, the national planning cycle. Flexible mechanisms: UNCTs are given flexibility to identify appropriate coordination mechanisms and consultative processes, with all stakeholders for drafting, reviewing and validating the MANUD. Country Context: CPC/Transitions countries ...?? 4 ¿Qué tiene de nuevo la Hoja de Ruta? 4 Hoja de Ruta 1. Hoja de Ruta ¿Qué tiene de nuevo la Hoja de Ruta? 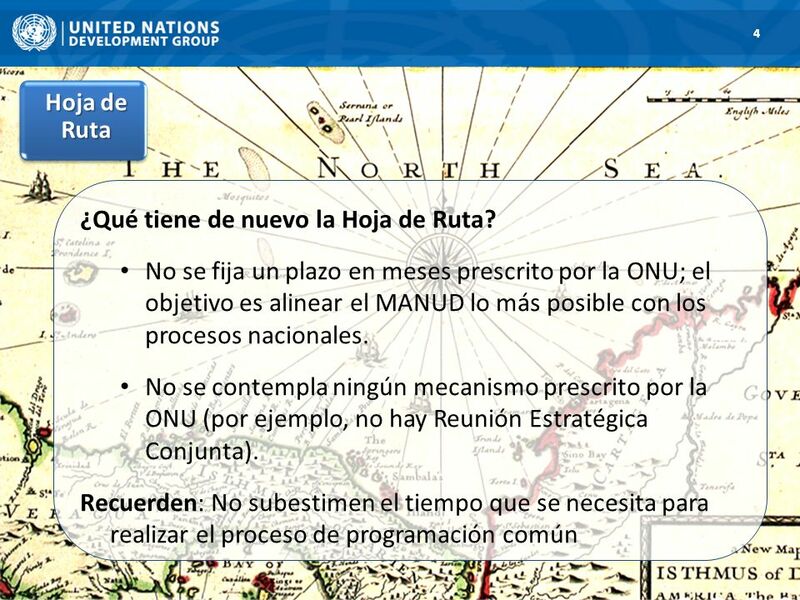 No se fija un plazo en meses prescrito por la ONU; el objetivo es alinear el MANUD lo más posible con los procesos nacionales. No se contempla ningún mecanismo prescrito por la ONU (por ejemplo, no hay Reunión Estratégica Conjunta). 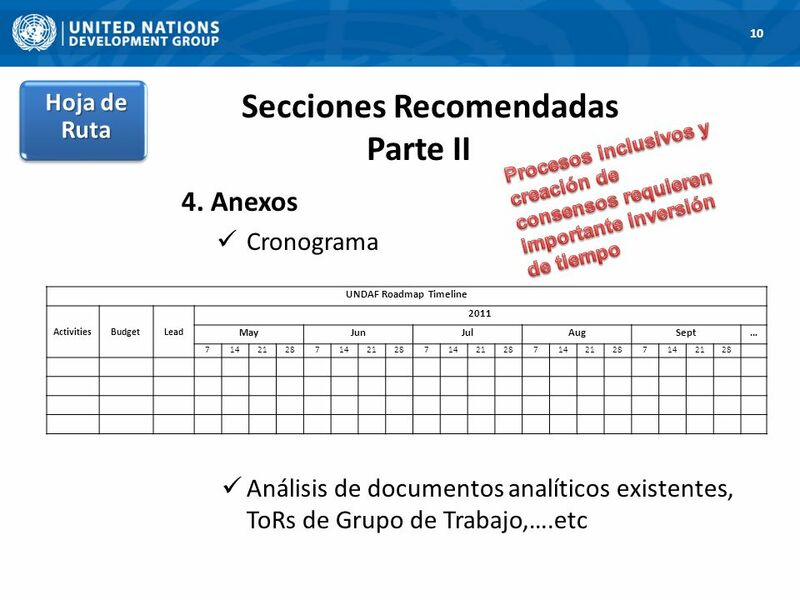 Recuerden: No subestimen el tiempo que se necesita para realizar el proceso de programación común For the sake of flexibility, as indicated in TCPR and UNCT feedback, the 24 month timeline that used to appear in the 2009 guidelines have been removed. The only ‘timelines’ per se that UNCT must consider are (1) national planning timeline/processes and (2) agency specific requirements for submission and approval of their respective country programmes to their governing bodies. Emphasize that despite the flexibility, UNCT should not underestimate the time and dedication needed to conduct the MANUD process. NB: allow ample time to get things done. 5 Hoja de Ruta ¿Qué debería incluir la Hoja de Ruta? (Parte I) El modo en que el MANUD irá alineado con el ciclo nacional de desarrollo Incorporar Lecciones Aprendidas Serie lógica de pasos, objetivos intermedios, y plazos Indicar las fechas de los talleres (por ejemplo, HRBA-RBM, SPR) Indicar las fechas para la revisión por parte del PSG de los borradores de los documentos Describir las responsabilidades y líderes para cada actividad Estimar presupuesto Identificar las necesidades de formación y las capacidades Refer to QSA Checklist (Have as handout!) 1. Does the Roadmap indicate that the MANUD will be aligned with national development planning processes? (Eg. national development plan; poverty reduction strategy; joint assistance strategy; sector-wide or programme-based approach; direct budget support) Will the MANUD commence in the same year as or one year after the national development strategy? If not, has the UNCT outlined a strategy to align the MANUD cycle in the medium term? Does the Roadmap make use of unique or particularly strong national capacities and mechanisms? 2. 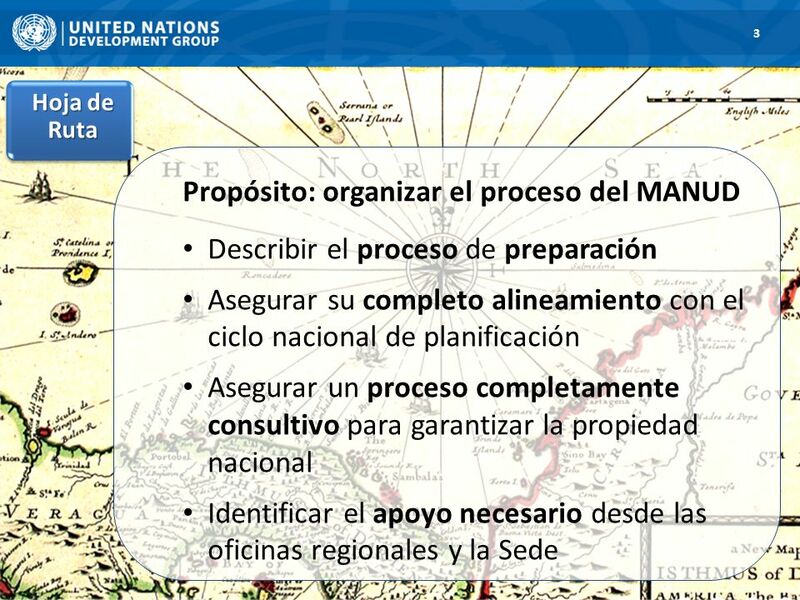 Does the Roadmap present a logical series of steps, milestones, and a timeline for the UNCT`s contribution to county analysis and for MANUD preparation? Indicative dates for workshops (HRBA-RBM, SPR) and skills trainings Indicative dates for the PSG review of draft documents How clear are the accountabilities? (Who is taking the lead for each activity and who will be held accountable for delivery?) Is the budget adequate, and is there cost-sharing amongst the UNCT? Has the UNCT built in sufficient time to complete the activities and products of sufficient quality to ensure a strategic MANUD? Have other training and capacity needs been identified? If no, does the roadmap indicate capacity assessment exercises? 6 Hoja de Ruta ¿Qué debería incluir la Hoja de Ruta? (Parte II) Cómo quedan incorporadas las partes interesadas y cuál será su implicación en el proceso? 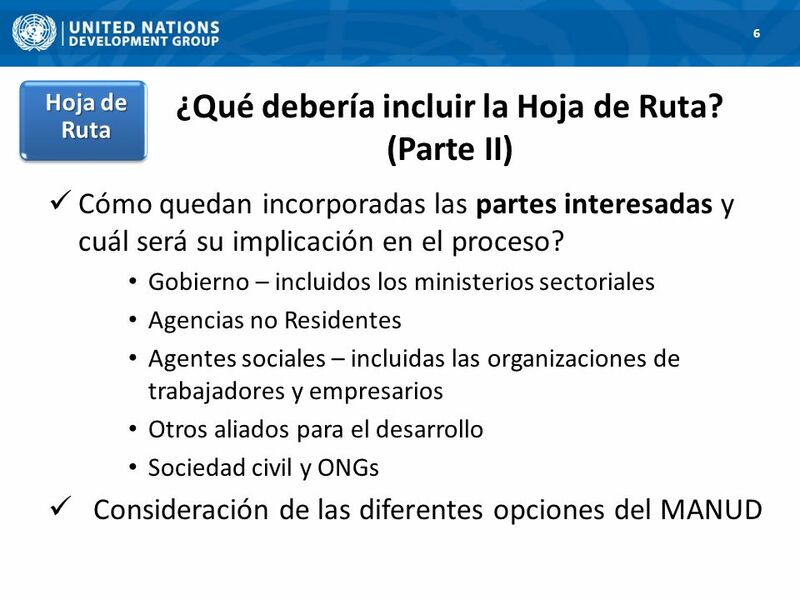 Gobierno – incluidos los ministerios sectoriales Agencias no Residentes Agentes sociales – incluidas las organizaciones de trabajadores y empresarios Otros aliados para el desarrollo Sociedad civil y ONGs Consideración de las diferentes opciones del MANUD Refer to QSA Checklist (Have as handout!) 3. To what extent have stakeholders been involved in the development of the Roadmap? Do stakeholders have a solid understanding of the MANUD process, its key building blocks and built-in reviews and how these will function? Has the UNCT informed and engaged Non-Resident Agencies (NRAs) in the process? If not, when and how does the UNCT plan to do so? 4. Looking forward, how will consultative processes in the Roadmap include stakeholders, and is there planned engagement with marginalized, disadvantaged and excluded groups? (Eg. the review of country analysis, assessment of UNCT comparative advantages, the Strategic Planning Retreat) In the MANUD Guidelines, ‘stakeholders’ refer to governments, including line ministries; social partners, including workers and employers organizations; other development partners relevant to a country context; civil society; and NGOs. 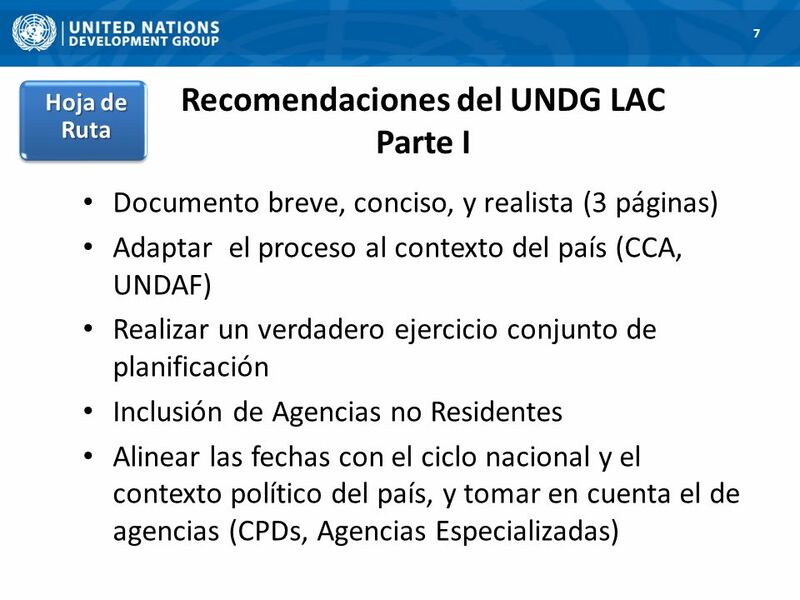 8 Hoja de Ruta Recomendaciones del UNDG LAC Parte II Incluir un cronograma detallado con fechas previstas para talleres, finalización, revisión, etc. 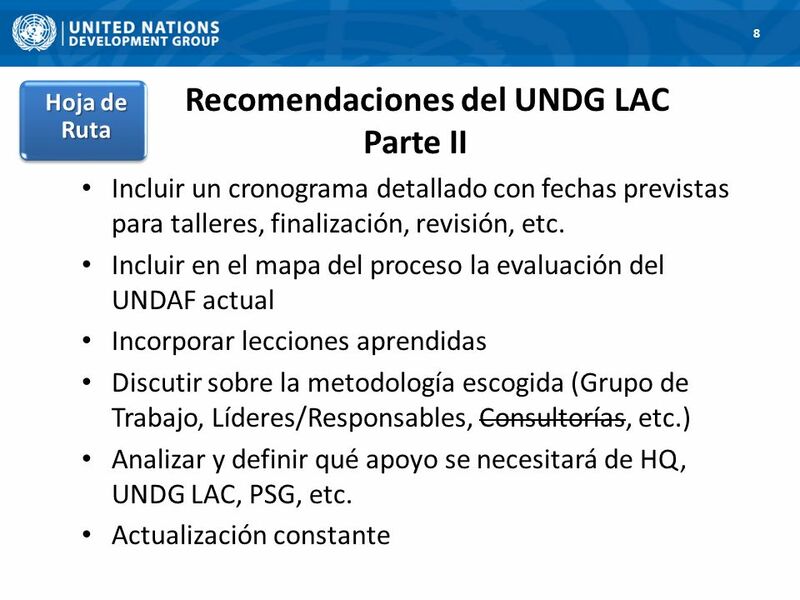 Incluir en el mapa del proceso la evaluación del UNDAF actual Incorporar lecciones aprendidas Discutir sobre la metodología escogida (Grupo de Trabajo, Líderes/Responsables, Consultorías, etc.) Analizar y definir qué apoyo se necesitará de HQ, UNDG LAC, PSG, etc. Actualización constante UN Comparative Advantages: the Roadmap spells out the areas where UN has demonstrated its expertise. The suggestion is for the comparative advantages exercise to show in what ways such expertise was demonstrated and also assess the perceptions of partners on UN comparative advantages. UN capacity assessment - it would be good to briefly give a background on how this assessment is planned to take place. While addressing UN capacity assessment and its comparative advantages it is equally important to note what other donors in the country are doing (their main strengths). 9 Hoja de Ruta Secciones Recomendadas Parte I Antecedentes (contexto, antecedentes ciclo anterior) 2. Objetivos y Proceso (mecanismo coord., resp.) 2.1. Alineamiento con los Desafíos Nacionales de Desarrollo (proceso planif. y contenido) 2.2. 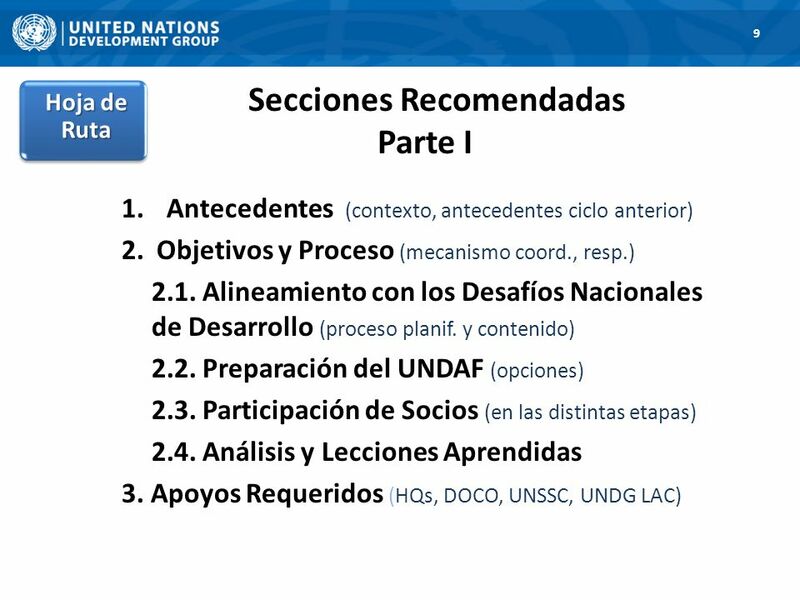 Preparación del UNDAF (opciones) 2.3. Participación de Socios (en las distintas etapas) 2.4. Análisis y Lecciones Aprendidas 3. 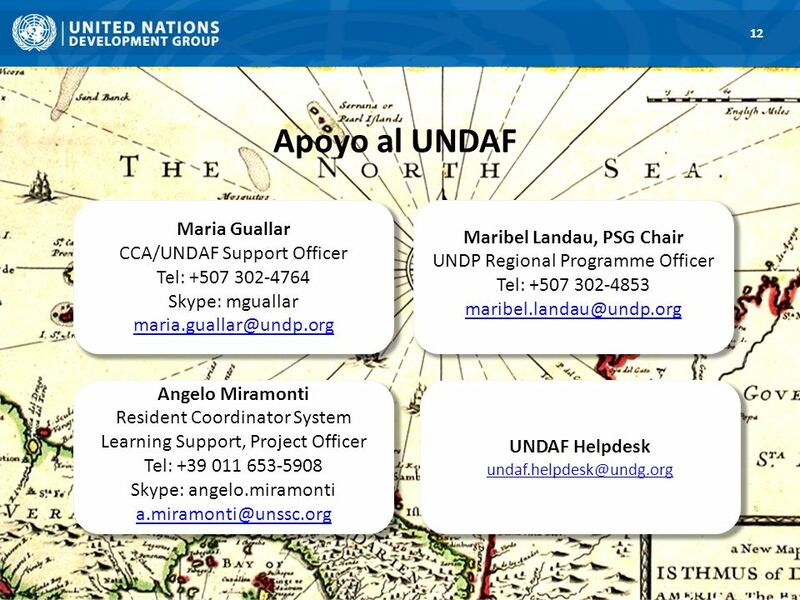 Apoyos Requeridos (HQs, DOCO, UNSSC, UNDG LAC) Refer to QSA Checklist (Have as handout!) 5. Does the Roadmap indicate that evaluations, lessons, or key studies from the current cycle will be used to formulate the next MANUD? 6. Does the Roadmap indicate that the UNCT has begun to consider the different options for the next MANUD and their implications? (Eg. MANUD with outcomes only or MANUD with outcomes and outputs; MANUD Action Plan) 7. What specific support needs have been requested by the UNCT from (1) Regional UNDG Teams, and (2) UN System Staff College and (3) DOCO? 10 Hoja de Ruta Secciones Recomendadas Parte II Procesos inclusivos y creación de consensos requieren importante inversión de tiempo 4. 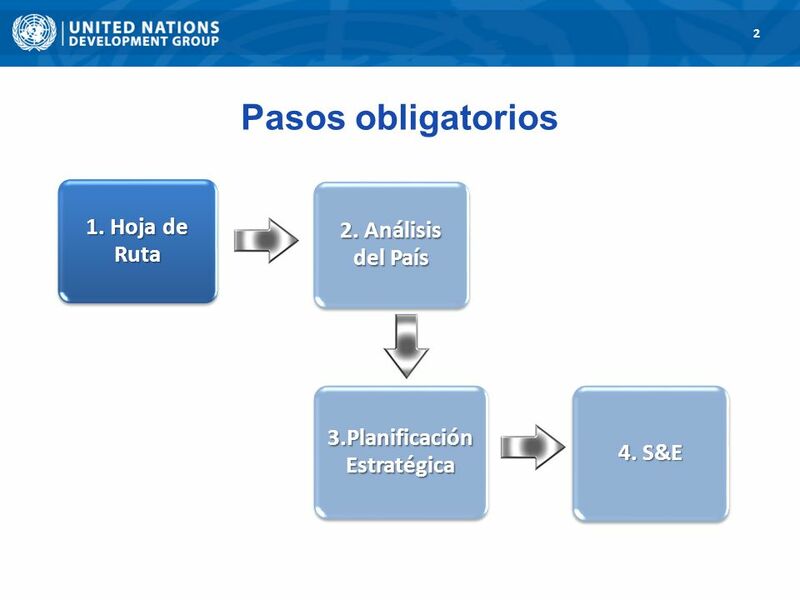 Anexos Cronograma Análisis de documentos analíticos existentes, ToRs de Grupo de Trabajo,….etc UNDAF Roadmap Timeline Activities Budget Lead 2011 May Jun Jul Aug Sept … 7 14 21 28 Refer to QSA Checklist (Have as handout!) 5. Does the Roadmap indicate that evaluations, lessons, or key studies from the current cycle will be used to formulate the next MANUD? 6. Does the Roadmap indicate that the UNCT has begun to consider the different options for the next MANUD and their implications? (Eg. MANUD with outcomes only or MANUD with outcomes and outputs; MANUD Action Plan) 7. What specific support needs have been requested by the UNCT from (1) Regional UNDG Teams, and (2) UN System Staff College and (3) DOCO? 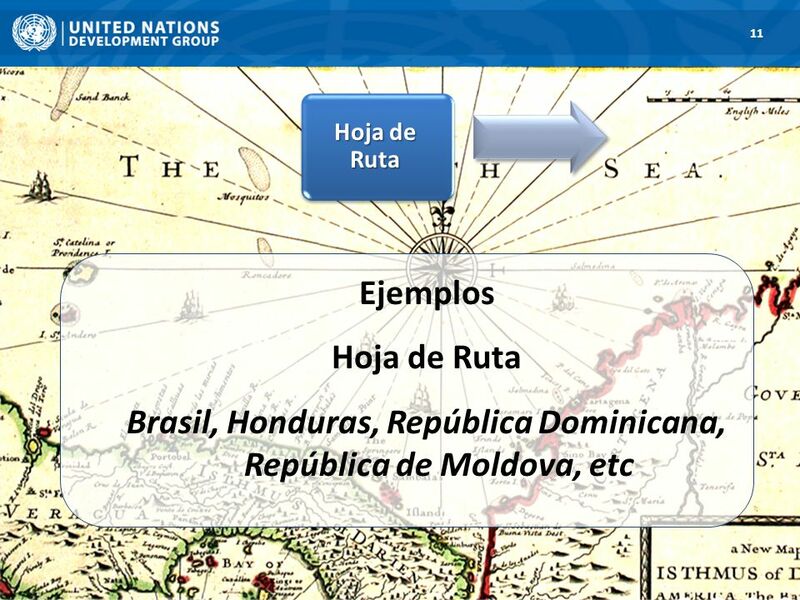 11 11 Hoja de Ruta Ejemplos Hoja de Ruta Brasil, Honduras, República Dominicana, República de Moldova, etc There should be handouts of the Moldova Roadmap together with sheet on what is good/could be improved about it. Descargar ppt "Paso 1: Hoja de Ruta del MANUD"
1 Simplificación & Armonización Introducción / Quito Junio 2002. Cuarto Estudio de Desempeño Global (OPS4) Consulta con Puntos Focales del FMAM Barbados Junio de 2009.